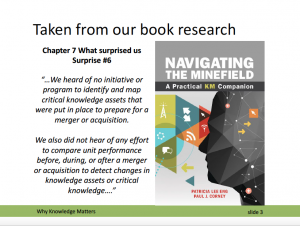 If so few Mergers & Acquisitions are successful why is Knowledge Management so often ignored? was how Chris Collison described the year following the largest industrial merger in the history of the oil industry. As one of the award winning KM team in BP the merger (acquisition) of Amoco some 20 years ago presented unique challenges and a great opportunity to demonstrate the real value inherent in Knowledge Management. 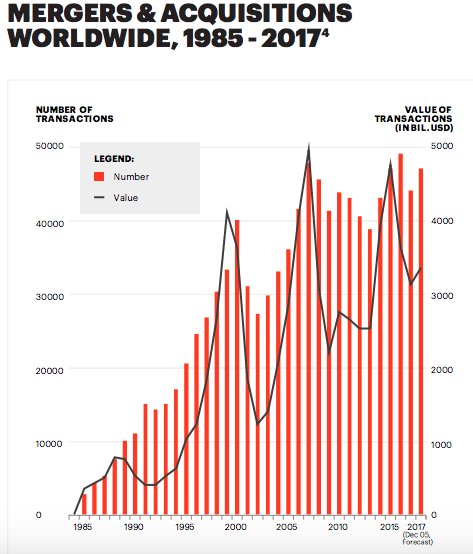 Yet KM has barely featured in Mergers and Acquistions (M&A) transactions in the intervening two decades? M&A activity shows no sign of abating as this recently published survey from Accenture demonstrates but perceived wisdom is that fewer than 25% of all transactions fail to realise the projected synergies. 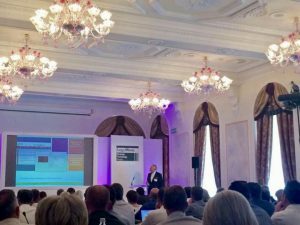 A few weeks back I had the great pleasure of exploring this topic in more detail with 100 or so senior global legal professionals. I’d been invited by the organisors, ALM (American Lawyer and Legal Week), to give the opening address to their annual European Strategic Technology Forum at a magnificent venue (Grand Hotel des Iles Borromees & SPA) on Lake Maggiore, Italy. A leading expertise discovery organisation: surely it makes sense to try and locate then validate /compare expertise in the to be merged organisations? People are at the fulcrum of of any successful merger and key in the realisation of the synergies often cited as the rationale for the transaction. A world leader in the use of social network analytics: as an acquiring organisation you’d want to know what’s behind an org. chart, who are the people that make it tick? Increasingly SNA is being used to see how strong networks are in a business. A recently merged industrial group: when one is a leader (and award winner) in KM surely their KM team would have a role? 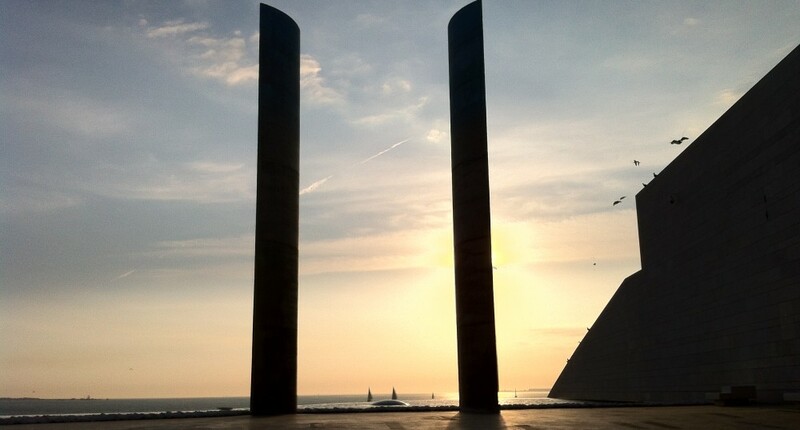 A previous winner of the prestigeous European Law Firm of the Year award: as an organisation who has invested heavily in KM and grown through acquisitions surely they woud have built KM into their due diligence and integration strategies? The anticipated demand for expertise discovery systems from organisations engaged in M&A activity has failed to materialise. It seems organisations are not interested in knowing what they know and what they are getting by way of expertise. In very few instances and in retrospect only do organisations undertake in depth analysis of networks in either the acquired or acquiring organisation. The KM team in the merged entity had to work really hard to reestablish a position since one of the organisations had a KM function and the other did not. It was not involved prior to the merger but acting quickly was able to demonstrate value through facilitating aspects of the organisation’s integration plan. In an organisation which has invested in KM capability and where knowledge is the core asset (Law Firm) any new entrant (firm or lawyer) has as a matter of urgency to contribute to the organisation’s knowledge base. A part of the senior management team of Sopheon PLC during the dot com boom I was tasked with overseeing the integration of many of the acquisitions it made. I worked closely with HR / Organisational Learning and Marcoms functions as well as Software Engineering and Product Development. We’d made the strategic decision and then looked in depth at the target and it’s skill base but often that was from a savings and efficiency perspective. We had no formal KM function yet products had years of knowledge and expertise embedded and we ran an extremely successful global knowledge network. I fear many people in KM are not close enough to the seat of power and seen as a tactical resource (fixers not originators) rather than people who help develop and drive through strategic initiatives. So how might we change that and get them a seat at the M&A table? Some years ago I was retained by a prominent venture capital group to help with techncal and managerial due diligence on acquisitions and investments. The model that a former colleague James Macfarlane and I developed looked at inter alia the culture of an organisation, it’s management style, who people went to for assistance and perhaps most importantly how it coped when the pressure was on. We also looked at how it used what it had learned before and fed that into how it developed its products. 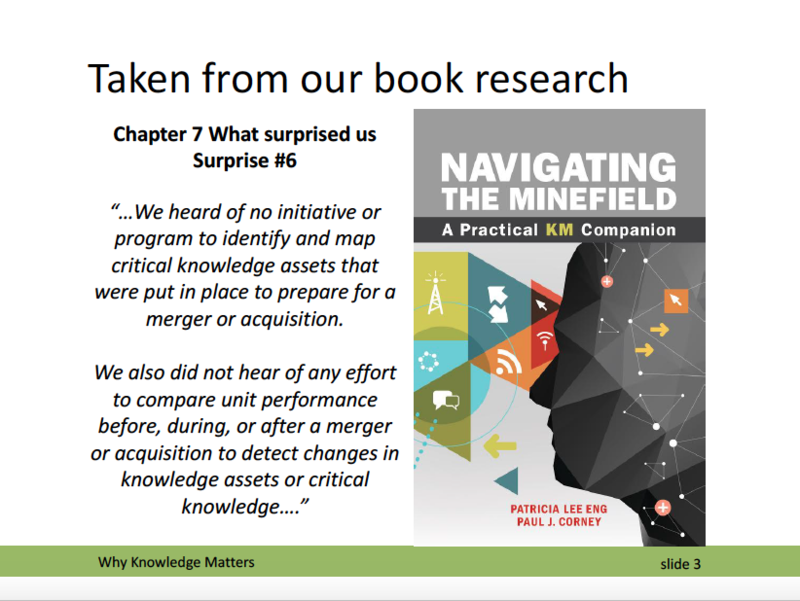 I realise now that much of what we were doing is what I’d expect a good Knowledge Manager to be able to do today on any M&A transaction. However tools and process are important so they will need to have a range of faciiltation and diagnostic techniques they can apply. 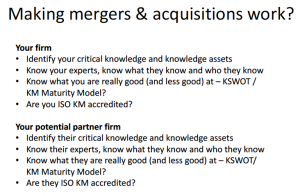 The impending publication of the ISO KM Standards might be just one of those since it will require those who have signed up to it to evidence adherence to a set of principles that rather neatly pick up many of the indicators that were in mine and James’ original Due Diligence Model. Here’s a very rudimentary set of questions to be focusing on. Watch this space: in the coming months I will be expanding on this. I have been remiss in not keeping up on postings. However the last two months have been extraordinarily busy with an assignment (helping to embed KM into the workstream of an organisation undergoing transformation), speeches, working on CILIP’s Knowledge Manager Certification process, getting started on a new co-authored book and working with Portugal’s Zero Food Waste movement to develop an application to improve the process of donation.